Our first travel day started early, with a flight at 7:30am. We (parents) had to wake up before our 18-month old baby, which we are not used to anymore. We left home somewhat late and had some frustrations when checking-in. But we made the flight. Our flight plan included a stop-over in Salt Lake City. Our first flight went very well. We were able to entertain Daniel with breakfast, watching take-off and landing, and reading the airline magazine (at his age, he now knows enough words to recognize a lot of pictures in travel magazines.. very convenient). In Salt Lake City, our 2nd flight was delayed and we ended up seeing more of the airport than we wanted. Fortunately, Daniel did great during this whole time, despite the fact that it spanned past his regular nap time: he enjoyed watching the planes come and go, and all the activity preparing for take-off. Then, he fell asleep before we even took off the second time, happy and excited. 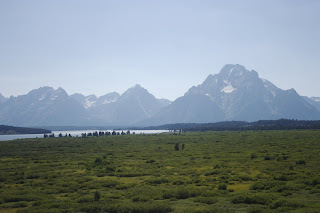 Upon arrival in Jackson, WY, we started our drive to the Yellowstone National Park, via Grand Teton. It was a beautiful day and we enjoyed the scenery a lot. 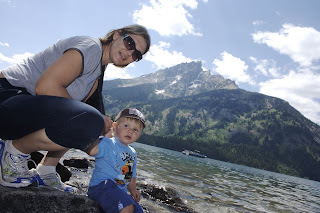 We made 2 stops in Grand Teton: one at Jenny Lake, one at the Grand Teton Lodge overlooking the beautiful Grand Teton Lake. Finally, we entered Yellowstone. We stopped twice to watch and take pictures of the Lewis river canyon and falls. 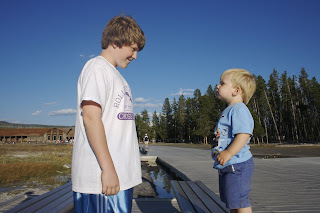 Then, we went straight to our first hotel in Old Faithful (the rest of the drive wasn't that interesting). 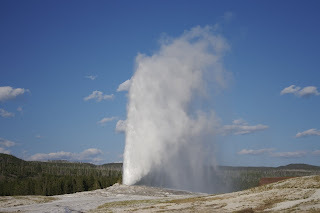 We arrived at Old Faithful right before one of the eruptions of the geyser, as the sun was getting down. It was a great, warm evening, and the light was perfect. We enjoyed being able to stretch and walk after the long travel. Daniel was particularly happy to have the chance to run around, and to find a group of teenagers who were jumping on benches and became his role models for the evening. Needless to say that, after all this activity, we didn't have any issues putting Daniel to bed on that day, despite being in a new environment.